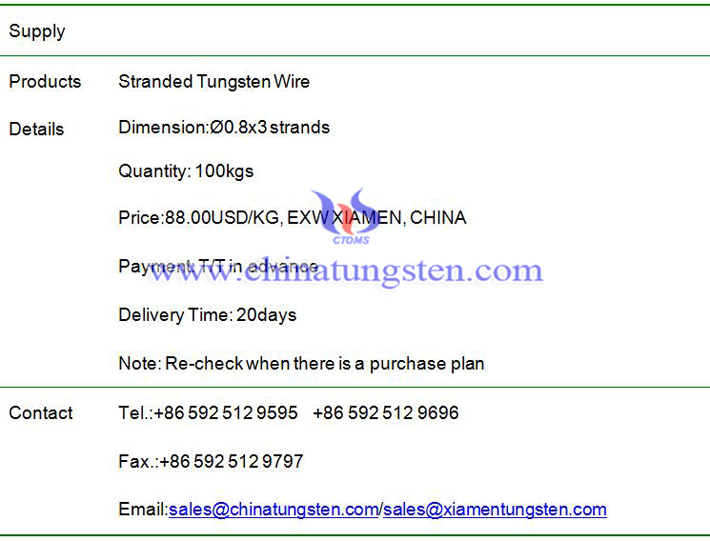 Ø0.8x3 stranded tungsten wire price is 88.00USD/KG on Mar. 21, 2019, EXW, Xiamen, China. Stranded tungsten wire is mainly used to make tungsten heater for coating industry. 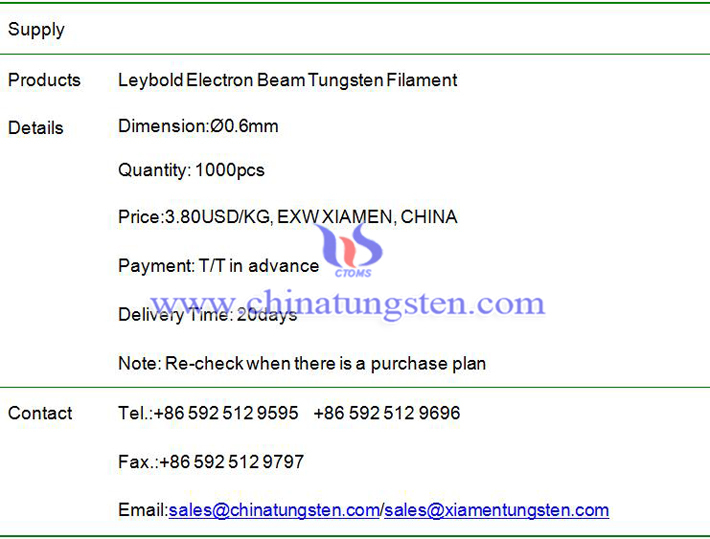 Center type coil tungsten filament price is 2.95USD/PC on Jan. 31, 2018, EXW, Xiamen, China. The different type filaments are used in varied types machines. The price is remained, but as for the change of exchange rate, the exporting price is a little higher than usual. Ø0.6 black tungsten wire price is 66.50USD/KG on Jan. 30, 2019, EXW, Xiamen, China. The price of tungsten raw material is fluctuctuating with small range, and now it is stable for the coming Spring Festival in China. 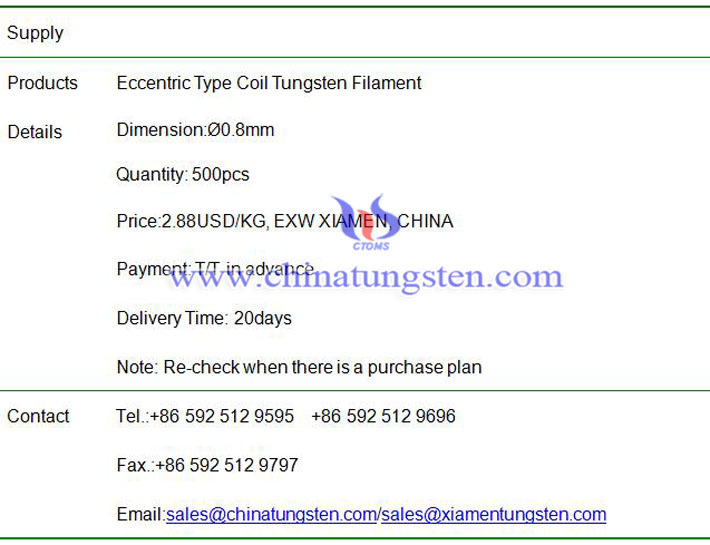 Most factories are closed for the holiday until middle or end Feb.
Eccentric type coil tungsten filament price is 2.88USD/PC on Nov. 21, 2018, EXW, Xiamen, China. The price of coil filament is not influenced by the raw material very much. These two weeks, the price of filament is remained the same and shows a little down because of better exchange rate. Ø0.6 black tungsten wire price is 69.20USD/KG on Nov. 21, 2018, EXW, Xiamen, China. Tungsten wire price is going down a little under the influence of decreasing tungsten raw material. Tungsten granule price is 65.00USD/KG on Oct. 31, 2018, EXW, Xiamen, China. Tungsten granule is made of pure tungsten material with irregular particles and is also called tungsten flux, tungsten accelerator, and tungsten granulate. 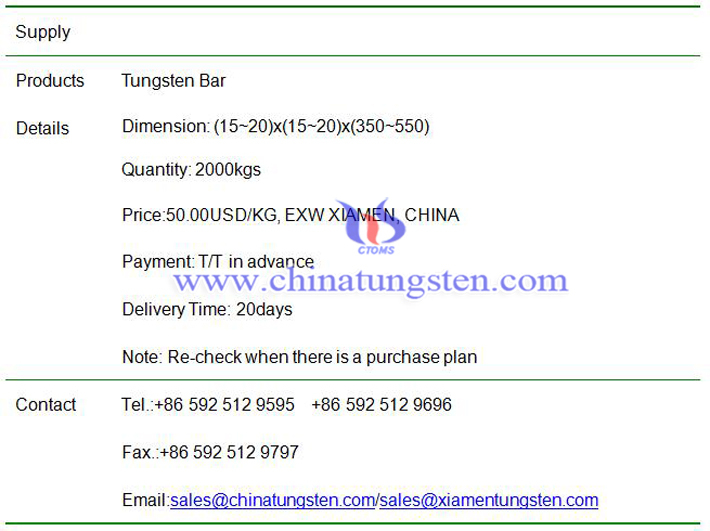 Steel Melting Industry used tungsten bar price is 50.00USD/KG on Oct. 31, 2018, EXW, Xiamen, China. The price of tungsten bar is going up and down with the raw material. After increasing for a long time, the price remains stable now, and shows some decrease last week, now it is stable. 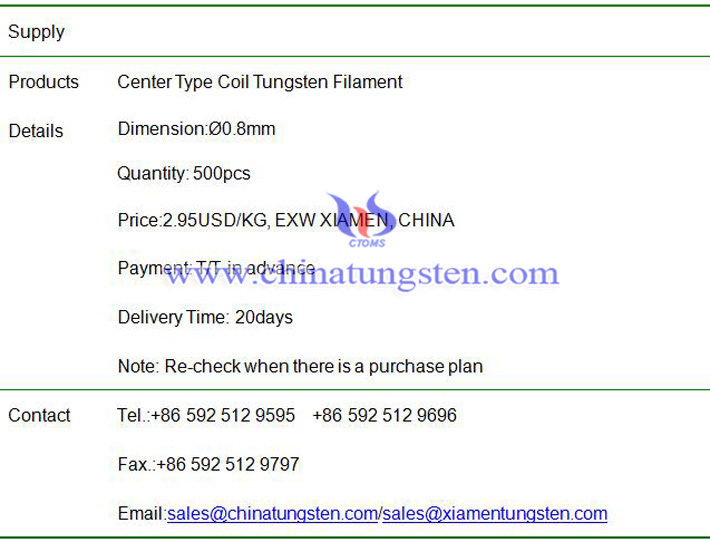 Coil tungsten filament price is 2.88USD/PC on Oct. 24, 2018, EXW, Xiamen, China. The price of coil filament is not influenced by the raw material very much. These two weeks, the price of filament is remained the same and shows a little down because of better exchange rate. 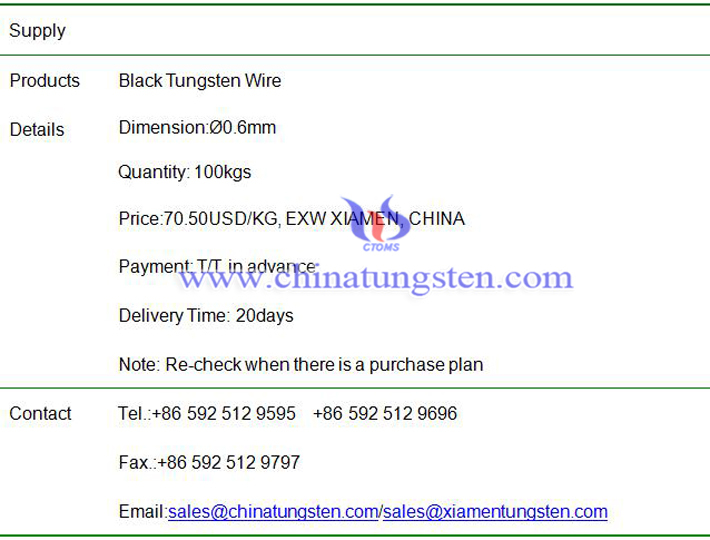 Ø0.6 black tungsten wire price is 70.00USD/KG on Oct. 24, 2018, EXW, Xiamen, China. The surface of black tungsten wire is covered a layer of graphite, which is used as lubricant during the production.